If you make your own lunch, nurse this is the recipe for you. Especially if you often have leftover wild rice or grains, site or if you’ve discovered a really good shortcut like I have. I found that Kashi makes a Whole Grain Pilaf, pharmacy that’s already cooked. Just open the bag and eat! Very handy for emergency lunches, and very tasty in this particular salad. Dried figs, green onions and pecans give it great flavor, texture and color. A light lemony vinaigrette brightens it up and makes for a very happy lunch. I know I haven’t been posting as much as usual, but the Holidays are hectic and I’m trying to get everything wrapped up before big winter Michigan trip next week. Hope to be back to my regularly proficient posting soon! Easy Winter Grain SaladUse any grain you have on hand: Rice, Wild Rice, Quinoa, Farro, Spelt, Wheat Berries, Brown rice, etc. They’re all great here. This salad is just as good the second and third day. Whisk the dressing ingredients together and set aside. 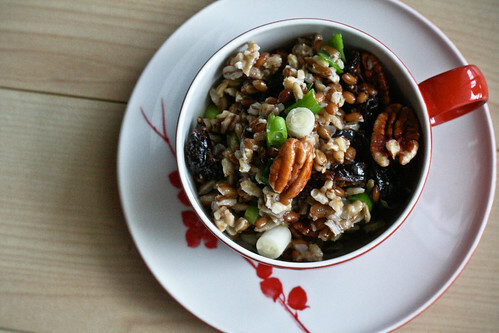 Combine the grains, figs, onion and pecans in a big bowl and mix thoroughly. Drizzle with as much dressing as you’d like. Eat immediately or store in the fridge until you’re ready for it. Hearty, well-balanced, versatile, and beautiful. Too bad green onions are hard to come by in NY in winter. Yup – I’m loving this. Thi looks like a great salad. Looks great! I love the green onion, fig, and pecan combo. I’m eating this RIGHT NOW and it is FANTASTIC!!! Thank you for the recipe! I have a “fruity nut rice” recipe that we love, but it’s nice to use other grains and fruit combos!